Butler County’s newest bus service will begin Tuesday with the debut of the new WorkLink route that will transport riders to jobs along the Interstate 75 corridor between northern Cincinnati and south Dayton, including stops in Middletown and Monroe. 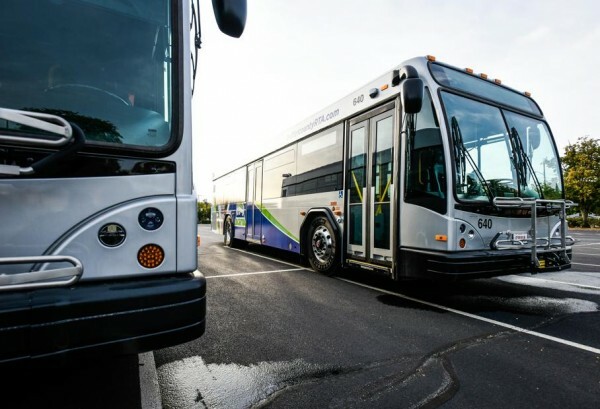 The new bus service is an effort among the cities of Middletown and Monroe, Atrium Medical Center and the Butler County Regional Transit authority to connect people to available jobs in Butler County. The route, which will connect Dayton and Cincinnati, is the first public transit connection between Greater Dayton RTA, BCRTA and Metro/Southwest Ohio Regional Transit Authority, officials said. Not only can workers from Dayton and Cincinnati connect with jobs in Middletown and Monroe, they can also connect to other routes on the Metro and Greater Dayton RTA systems as well as the CATS system in Greene County. With several stops, the route will run six days per week and cover all three work shifts at $2 per ride, said Matthew Dutkevicz, BCRTA executive director. The WorkLink route connects the Greater Dayton RTA hub on Lyons Road in Miami Twp. and the Metro/SORTA Park & Ride at the Meijer store on Tylersville Road in West Chester Twp. The route between these two destinations includes two Monroe stops in Park North, with one next to the new Amazon facility and the other across the street from the Home Depot facility, as well as stops at PAC Worldwide and Atrium Medical Center. “The WorkLink route really showcases the region coming together to connect the available workforce with the open positions in the area, particularly in Middletown and Monroe,” said Jennifer Ekey, Middletown economic development director. Atrium Medical Center officials said they see many benefits of having a stop along the WorkLink. Dutkevicz previously told the Journal-News that the route would be funded through a federal grant that would be obtained by Middletown Transit Service to cover 50 percent of the costs and the remaining 50 percent would come from local matches from cities of Middletown and Monroe. Getting people to work is something BCRTA does with the route between Hamilton and Middletown and other connectors into Hamilton County. That route has a stop throughout the day at the Kohl’s distribution center in Monroe. Future additions to the route are expected to be announced as a broader group of public and private partners continue to build regional transportation solutions, officials said.